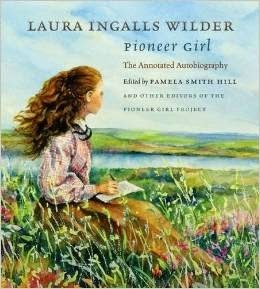 I have been providing pioneer and Laura Ingalls Wilder workshops for small groups for a couple of years now. Slowly I've been collecting pioneer items to share with children. Many of these are small items, but I knew I wanted something larger for when I share about the life of Laura Ingalls Wilder to large groups of children at a school assembly. 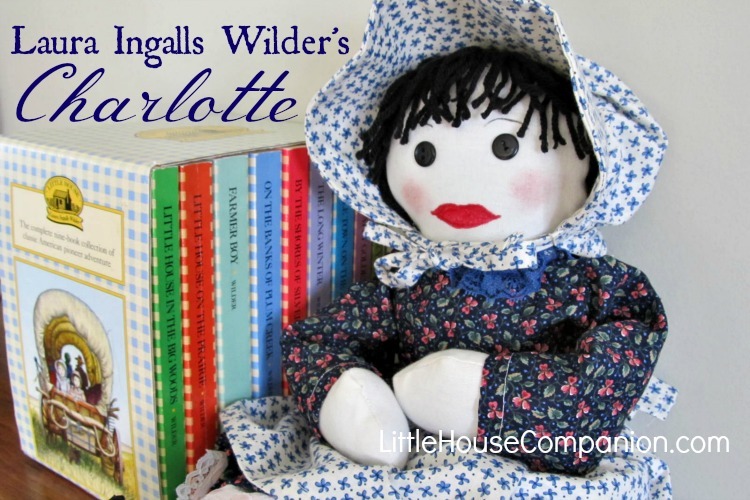 To further enhance my presentations, I asked my talented Aunt Kathy to make me a Charlotte doll. 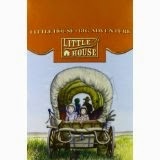 She had only Laura's description from Little House in the Big Woods to go on. I marvel at my aunt's talent. She loves to make dolls (and teddies and bunnies), and it shows. "She had a face of white cloth with black button eyes. A black pencil had made her eyebrows, and her cheeks and her mouth were red with the ink made from pokeberries. 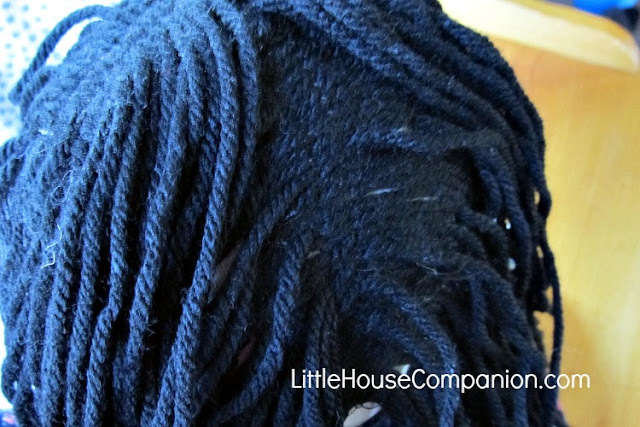 Her hair was black yarn that had been knit and raveled, so that it was curly. She had little red flannel stockings and little black cloth gaiters for shoes, and her dress was pretty pink and blue calico." I am so grateful to my aunt Kathy for bringing her to life. Read more about Aunt Kathy's process and see more pictures below. Aunt Kathy said, "I opted out of the red fabric for her legs. I decided it just wouldn't be right, and went on a mission to find red socks. Unsuccessful with knit ones. I ended up buying a red knit hat & I cut out her socks from it LOL." Don't you just want to hold this hand? 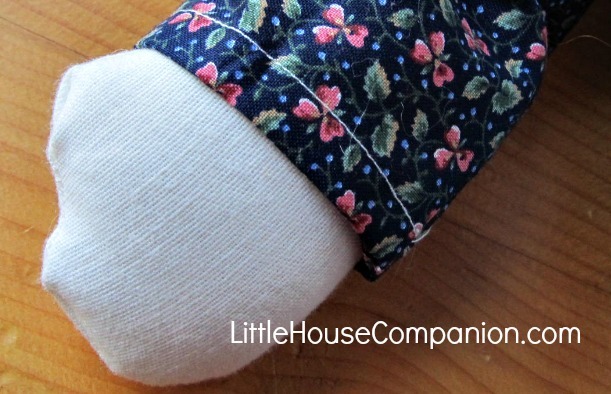 And do you see how Aunt Kathy found the perfect blue and pink calico fabric? Aunt Kathy said, "I ended up using stitchless glue to put her hair on. I did 2 sections to give her a good cover. I did take some tacking stitches to help keep it in place. Her hair is wavy just like it says. I crocheted some black yarn & then unraveled it. I did not trim up the back. I felt trimming it straight across just wouldn't suit her look." The hair didn't photograph well, but I hope you can see the stitching across her crown (top-left of the photo) and down the back of Charlotte's head, too. Aunt Kathy said, "She has real blush for her cheeks & you can touch it up as needed. This is what I use. I think fabric paint is just too harsh of a look. Powdered blush works great, or even pink eye shadow." 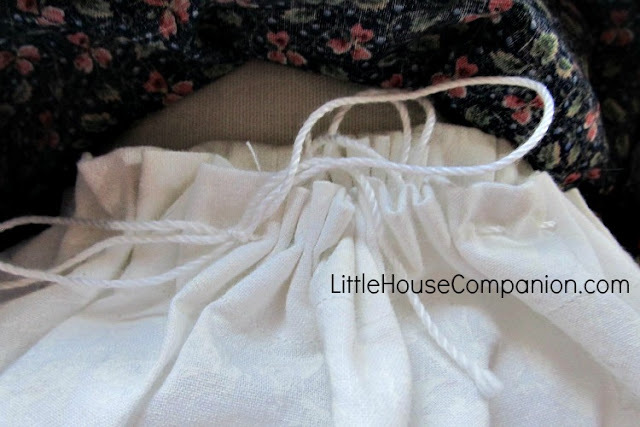 Aunt Kathy said, "I had put elastic in the waistbands of her bloomers & petticoat, had her all dressed, but the thought of the elastic just nagged me, because it just didn't seem right, soooo I took the elastic out & stitched drawstrings on them. This is what happens while I'm bringing a doll to life. 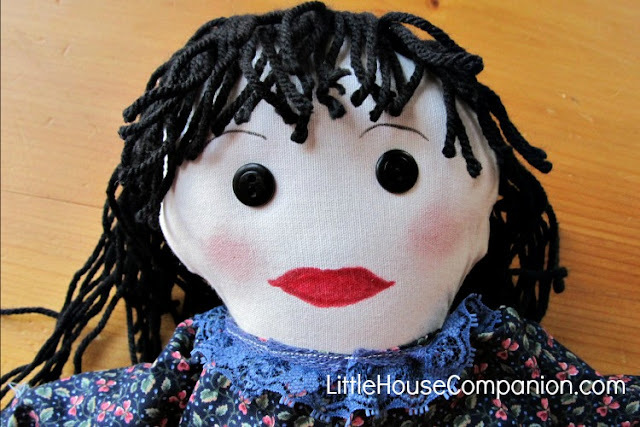 As the doll becomes more than just a pile of fabric, a personality begins to form, & I start getting thoughts & ideas." Though Laura did not write of the bonnet and apron, she wrote of making a straw hat for Charlotte later in chapter 12: "The Wonderful Machine." 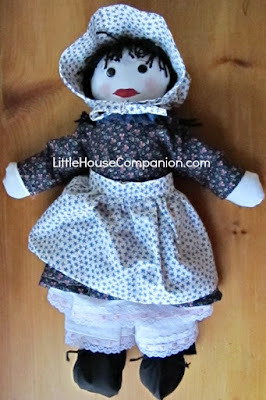 I thought Laura would have made a bonnet and apron for Charlotte, too, so I asked Aunt Kathy to include them. 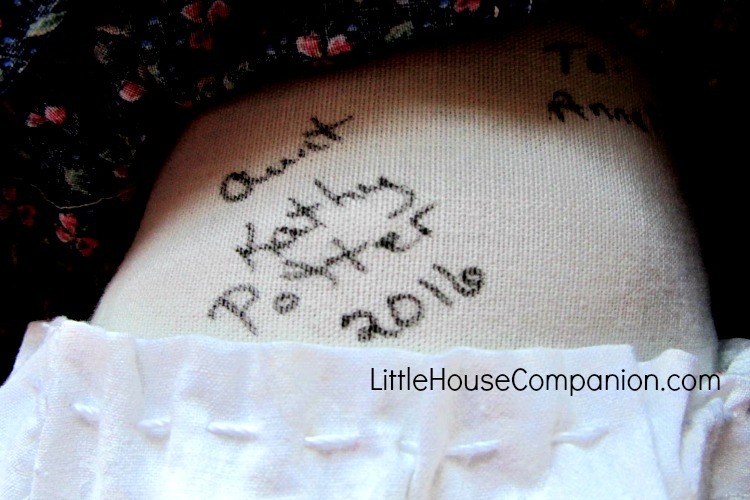 Aunt Kathy also signed Charlotte's backside. She told me she does this with all of the dolls she makes, but it truly touched me. I am so thankful for Aunt Kathy's hard work and talent. Charlotte is a beautiful doll. 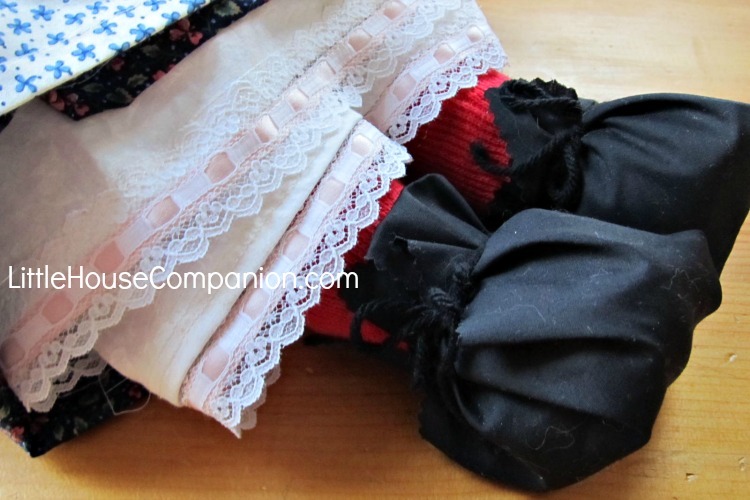 You can also see more of that drawstring waist in Charlotte's petticoat in the photo below. If you want to see more of Kathy Potter's talent, I'd suggest you visit her group on Facebook. I can't wait to take Charlotte to meet children!